Grateful as some are that Apple builds microphones into the iMac and its laptops, no one with a fully-functioning set of ears would claim that the results of recordings undertaken with these built-in mics are wholly satisfying. No, to avoid the kind of background noise and generally-lo-fi results you get from Apple’s mic you need an external microphone. And one of the easiest ways to connect one to your Mac is via the Mac’s USB interface. A variety of companies make USB mics that work with plug-and-play simplicity. I recently rounded up a collection of popular USB mics, compared their specifications, and recorded test files; I now present the results of my work. This collection includes Blue Microphones’ $139 Snowball , Marshall Electronics’ $170 MXL.006 USB , Rode Microphones’ $369 Podcaster , and Samson’s $232 G-Track . All the microphones I tested are of the cardioid condenser type. These are directional microphones that pick up sound in front of them in a heart-shaped pattern. 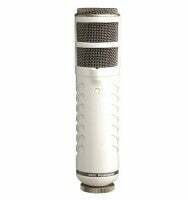 The Snowball microphone has an additional omnidirectional mode that, with the flip of a switch, allows the mic to record from all sides. Each microphone includes some variety of mounting hardware: a stand for the MXL, G-Track, and Snowball mics; and a stand mount for the Podcaster. No special drivers are necessary for the microphones to operate. When you plug them into your Mac, they appear as an input option in the Sound pane of System Preferences—identified as either USB Audio Codec (for the MXL and Samson mics) or by the microphone’s actual name. The gain of the Podcaster and Snowball microphones can be adjusted via the Input Level slider in the Input tab of Sound preferences. This slider is grayed-out with the MXL and Samson microphones; instead, these mics include hardware controls for adjusting gain. On the MXL mic, this appears in the form of a three-position switch marked Lo, Med, and Hi. The Samson G-Track offers a gain knob marked Mic; once you’ve adjusted the gain to your liking, you press the knob to lock it in position. The G-Track also includes an LED that glows green until you over-power the mic, at which point the LED turns red. This is a nice touch as it makes it easy to adjust and test the gain without having to record a long segment, only to realize afterwards that the gain was too hot. The G-Track sports two additional knobs, which hints that it’s more than simply a USB microphone. Above the Mic knob you’ll find the Inst and Volume knobs. The Inst knob controls the gain for the miniplug input ("In") port found on the bottom of the microphone. You use this input for connecting—and, thus, recording—instruments such as an electric guitar, bass, or keyboard, or for recording a line-level input—the output from a tape deck or mixing board, for example. 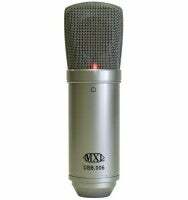 To switch between instrument and line-level input, there's a toggle switch on the left side of the microphone. The G-Track's Volume knob controls output volume from the mic's built-in Headphone jack, also found on the bottom of the mic. Plugging your headphones into this port allows you to monitor the mic’s input directly, without the latency you’re likely to get from sound going through the G-Track, into a tethered computer, and back out to the laptop or microphone’s headphone jack. But if you want to hear what’s coming from the computer—from a digital audio workstation application such as GarageBand, for example—you can flip another toggle switch on the side of the G-Track to the CPU position. 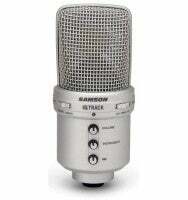 The Snowball microphone includes a three-position switch on the back. The first position puts the microphone into cardioid (directional) mode, the second position places a -10dB pad—lowers input gain by -10dB—on the cardioid function, and the third position switches the microphone into omnidirectional mode, where it records sound from all sides rather than just those sounds in front of it. The current Snowball uses different electronics than the original version of the mic—which we previously reviewed—and those electronics improve its sound. If you tried a Snowball when it first appeared on the scene and weren’t happy with its sound, try today’s model. You’ll notice a distinct improvement in sound quality. If I were a professional voice-over person and knew how to perfectly work a mic, you’d hear greater differences between my AKG microphone and the USB mics in the test files linked to this review. Yet even with inexact mic techniques, to my ears the AKG C414 EB sounds richer than the USB mics. This is hardly surprising, given that this mic is most at home in professional studios, whereas these far-less-expensive USB microphones are designed with computer users (and their budgets) in mind. But it means that if you’re looking for perfect audio, you’re not going to find it in one of these USB microphones. That said, you can still get perfectly decent audio from them. Among the USB microphones I tested, I found the MXL and Samson models to provide the most-balanced audio as well as an acceptable amount of gain. It’s difficult to pull deep-baritone, FM-DJ sound from these things, but what you do get is quite listenable. 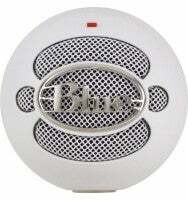 The Rode Podcaster and Blue Snowball microphones produce reasonable sound quality once you boost, with your recording application on your computer, the volumes of files you’ve recorded—but boost them you must, because their gain is low, even when you crank up the Input Volume slider within OS X's Sound preferences. These are mics you want to get really close to in order to produce a lot of sound. But when you do, you risk a plosives problem—popping Ps and Bs. If you demand a microphone that sounds like those found in a professional recording studio, none of these USB microphones is what you’re after—instead, get a “real” microphone, plug it into a USB or FireWire interface, and learn to use it. If you don’t require pristine audio and prefer the convenience of a plug-and-play solution, either the Samson G-Track or MXL USB.006 is a good option, with the G-Track getting the more-enthusiastic nod thanks to its more-flexible recording and output options. Senior editor Christopher Breen hosts the Macworld Podcast.